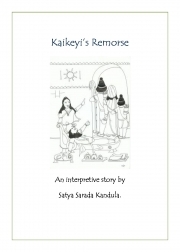 Description of "Kaikeyi's Remorse (Illustrated) (eBook)"
How did Kaikeyi feel when she lost everything with her decision to send Rama into exile? This interpretive short story explores Kaikeyi's feelings of remorse and how she came to terms with them. It will be of interest to readers who like different interpretations of Ramayana. It will be of help to people who are struggling with their own feelings of guilt and remorse. It will also interest students of indian philosophy. Satya Sarada Kandula has spent several decades of her life reading different versions of the Ramayanam and also the original Valmiki Ramayanam in Sanskrit. It competes with the Bhagavad Gita as her favorite book. She has an M.Tech electronics from I.I.Sc, and career experience in the software industry, the education sector and in writing 'blogs and books'. Please visit :For more information on her other books, audio etc please visit : http://satyasarada.wordpress.com for details on her other books and for purchase of ebooks using paypal! Reviews of "Kaikeyi's Remorse (Illustrated) (eBook)"